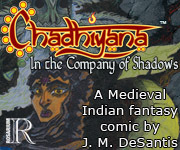 There’s a lot to announce this week concerning Chadhiyana, and even more to come in the coming months. 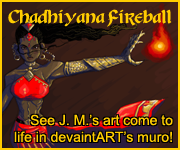 Next month is the Baltimore Comic-Con (September 5-7, 2014), and amongst its many Artist Alley guests will be Chadhiyana creator, J. M. DeSantis. However, even before Baltimore is the Boston Comic Con this weekend (Friday through Sunday). Amongst the highlights of the convention are a panel on which J. M. DeSantis will be speaking (on Friday) and the release of a new edition of Chadhiyana. 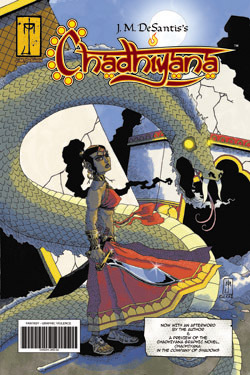 This second edition of Chadhiyana (the first comic) features new cover art (by J. M. DeSantis), the new Chadhiyana logo (created by Corey Breen–which is now featured on the site, if you haven’t noticed), and the Prologue of Chadhiyana: In the Company of Shadows, as well as a new afterword by J. M. DeSantis. The reason for including the Prologue of the graphic novel was that the original book was too short (a mere 16 pages), however J. M. DeSantis did not want to include new content which would force previous buyers to re-purchase the same book just for new content. Plus, it would give new buyers an introduction to the graphic novel. What’s more, much of the original book was imperfect–especially the colours as they compared to the original art. Whether you bought the original edition or not, this second edition is the definitive version. The book looks fantastic and the colours are the best match to J. M. DeSantis’s original art that have been possible up to this point. If you are attending the Boston Comic Con, the thirty-six page second edition will be available at J. M. DeSantis’s Artist Alley table. It will also be available through IndyPlanet.com (follow the link in the side bar) and other forthcoming sellers soon, so stay tuned for an announcement about that. As for the aforementioned panel, J. M. DeSantis will join fellow Comicbook Artist Guild members Keith J. Murphey (creator of TORN) and E. J. Barnes for Self-Publishing in Independent Comics. The panel will take place on Friday night at 7 pm in Waterfront Ball Room 1. If you have an interest in self-publishing, make sure you put this in your agenda. All three participants in the panel have a wealth of knowledge and experience in the area of self-publishing. It promises to be an informative discussion. So, if you’re attending the Boston Comic Con this weekend, make sure to stop by J. M. DeSantis’s Artist Alley table. If not, put Baltimore Comic-Con on your calendars, or New York Comic Con in October. There is that convention too. For more on the Boston Comic Con visit bostoncomiccon.com. For more on Baltimore Comic Con, visit baltimorecomiccon.com.